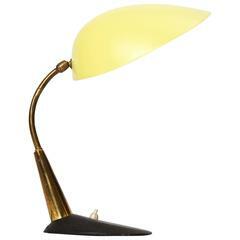 Articulated table lamp Mid-Century Modern painted metal and brass shade adjusts, Italy, 1950s. New socket and rewired. 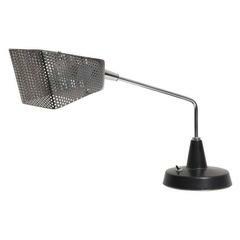 An articulated table lamp Mid-Century Modern the architectural design crafted of nickel painted metal and wood shade adjusts new sockets and rewired Italy, 1950s. 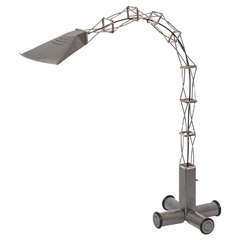 Sonneman articulated table lamp Mid-Century Modern shade adjusts nickel and painted steel, 1960s. 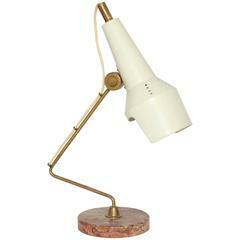 Italian Mid-Century Modern opaline shade night table lamp Newly re-wired to US standard. 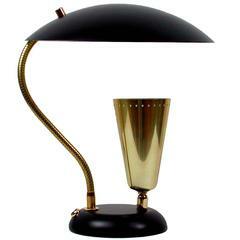 Adjustable articulated desk lamp in Stilnovo style, in black metal and brass. Dimensions: shorter arm 22 cm; longer arm 46 cm; cup diameter 39 cm. Italian desk lamp with original colour shade. Shade measures: 26cm x 22cm. Italian wood and brass table lamp with a marble base, good conditions overall, electrical parts are fully restored. It works with both 110 and 220 Volt. 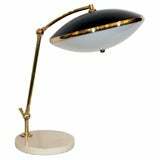 Elegant and rare Mid-Century Modern table lamp. Manufactured probably in Italy in 1950s. The lamp is executed with one x E27 screw fit bulb holder.